When people talk about bespoke, purpose made, or made to order, this usually is a reference to sizing, especially in the world of garage doors, but it is also possible to have a totally bespoke garage door made entirely to your design with a mixture of materials and almost any colour. The mechanism for operating the garage door can even be bespoke as long as it is within tested parameters and complies with safety regulations, especially if it is remote control electric operated. So, what garage doors are available? If we look at the doors by category then it may make it simpler, and after all. many people have to have a certain type of mechanism to work with the inside conditions of their garage and also to work with the size of the door and other factors first. Lets start with ‘Up and Over’ one piece garage doors. For a start it is perfectly possible to have almost any design using timber as a basic material, and over the years many timber panels have been produced by various joinery companies to then have the operating gear purchased separately, and in most cases this is a belt and braces retractable lifting gear to assist the door panel up and down with the components fitting directly to the timber panel. This method is fine if the door panel is not too big or heavy and also remains stable in varying climates throughout the year in the UK, but is not ideal. The better method is to buy one of the Hormann 2011 ‘open for infill’ doors which offers a prefinished door chassis, gear locking and sub fixing frame all in one, with the only item missing being the timber infill for the door design. The latest Hormann offering is the NT500 system replacing the DF98 mechanism and providing the perfect platform for construction of a bespoke garage door whilst still having all the safety and stability of a tested framework and mechanism already sorted. This range of doors can be purchased up to 5000mm wide and offers everything required for adding the timber in whatever design you wish and the only restriction is operating within the weight limits for the mechanism, so a little caution with timber species like oak for example, which is very heavy indeed. These doors can have a wide variety of electric operators fitted if required and if the weight is a problem then there is also the option of the ET500 ‘open for infill’ door. This is a very heavy duty door chassis as its origins are for underground car parks with heavy usage all day long. It offers the same principal of a chassis with an open canvas for infilling to your own designs but with far higher weight limits and a very unique and smooth up and over action. To get one piece up and over doors in a bespoke design in steel or GRP is not really an option even though you can have various designer elements added to certain standard panel designs in various colours this is not providing a totally unique design as the design elements are limited as well as the colours from the factories. 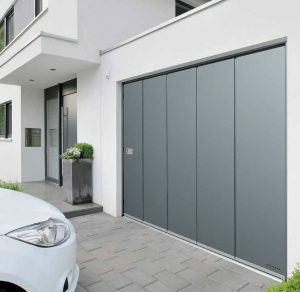 Sectional garage doors are fast becoming the door of the day offering fantastic levels of weather sealing and insulating properties as well as the mechanism which means the door panels never swing outwards during operation. The sectional garage door can again be made into almost any design in timber with Hormann and Carteck offering a design service when a design is submitted for approval to the factory. The door will be specified and an image produced for approval. In steel the design choices will be a little more limited but there are companies like Breda, in Italy, who will produce sectional doors in other materials such as fabric or stone and glass. However these doors generally have a basic chassis design like so many other doors so there is a stable, tested and approved system operating underneath the facade. Hormann produce a sectional door designed to have extra material on the front face offering the chance to blend in a sectional door in to its surroundings with some clever cladding. There is also a bigger demand for fully glazed sectional garage doors either in clear or smoked glazing options and options such as single, double or even triple glazed panels. The ALRF42 Vitraplan is a good example of a door designed for commercial use which is now in demand for domestic use where a ‘glass garage door’ is a requirement. Also remember the sectional garage door will go up to far larger sizes than a normal up and over can because the door is split into sections, spreading the load and stresses during operation over several wheels and the tracking used. A sectional door can also have various tracking options internally to allow a door to open horizontally but also every angle through to straight up the internal wall with vertical tracking. This does allow a sectional door to overcome many obstacles and also get the door high up handout of the way in larger garages and maybe with a vaulted ceiling. Roller garage doors cannot really offer much more than various sized horizontal slats and are mainly purchased for their mechanism and neat, tidy offering. The roller door cannot be anything except horizontal lines in its design but does have the ability to be in almost any colour required. A bespoke offering could be considered using the Hormann spiral door, essentially a high speed insulated door with high insulation, super fast operation and security. This would be the ultimate roller garage door for anyone with deep pockets. Side Hinged garage doors are like up and overs doors in that they are usually 2 timber or steel panels hinged on the outside, and being a one piece and solid panel design, the side hinged doors can be almost any design when made from timber and then can be enhanced with a wide range of furniture options which of course also means you could get bespoke components for the door. Side hinged garage doors are also available in steel and GRP, but the designs are ranged with very little variation in design options but you can get almost any colour and a wide range of window options to personalise your door. Using timber for side hinged doors will also mean you can produce doors with unusual shapes such as arched at the top. It also means you can specify a wide range of timber species as the weight issue may not be such a problem as they swing outwards, or inwards. It is only the hinges and the sub frame that may need worrying about. Round the corner garage doors can again be made into many design variations when using the side sectional door where each panel sliding around the corner is an individual panel usually about 350 – 450mm wide manufactured from timber and has the ability to be almost any design based on a predetermined specification produced by the factory from a customer drawing. The nature of a sliding round the corner door means the panels can spread their weight evenly along the tracking so weight isn’t an issue with these type of doors. Rundum Meir produce the best side sectional doors in timber. Steel is available, but not so popular these days, although the Hormann HST is proving to be very popular, using the tried and tested panels from a sectional door and therefore offering high levels of insulation and a wide range of styles and colours to choose from. The Delta Overlap sectional and the original Silvelox door still some under the up and over principal, but, with a great difference in mechanism and operation. The Overlap is always in 2 solid sections and the fairly unique lifting mechanism means no internal tracking is required at all unlike every other type of heavy garage door using normal up and over gear. The original Silvelox is based on the same construction methods but is a one piece up and over using a cantilever weight principal and all the doors are manufactured from timber, albeit a very high quality engineered timber section construction. Bespoke garage doors are possible but in some ways limited as timber is probably the only true versatile material in construction where you can get truly unique designs with various timber species and not have to worry about reinventing the wheel at the same time as the methods are tried and tested. 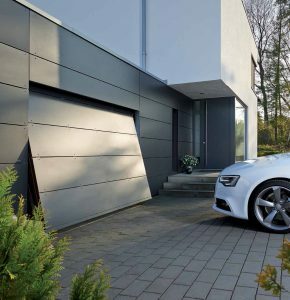 The main reasons for bespoke garage doors tends to be either compliance with a design requirement in the local vicinity because of planning issues or to create a truly personal door design for a modern house build.